This is an early stand-alone from John D. MacDonald, a writer best known for his series featuring Travis McGee. MacDonald was a prolific writer, but he was also very widely read and often incorporated social and economic themes into his books as he does here.The book, which was first published in 1953, is set in a declining industrial city somewhere in the Midwest. At the center of the story is the family that runs the Varaki Quality Market. The patriarch, Gus Varaki, once ruled the family and the business with a strong but benevolent hand, bringing into the business and the family outsiders who had fallen on hard times and who needed a helping hand. In particular, Gus has a close relationship with Paul Darmond, the local parole officer, and Gus has offered jobs and a home to two parolees that Darmond has recommended.But the family has fallen on hard times, emotionally if not financially. Gus's wife dies and that places a huge emotional strain on him. He later marries again, this time to a much younger woman, and his spirits are briefly revived. But then his middle child, Henry, is killed in the Korean war, and the loss saps Gus of his energy and attention.In consequence, both the family and the business begin to drift. Gus's other son, Walter, is deeply dissatisfied with his wife and with his life in general and takes advantage of his father's distraction. Gus's only other child, a daughter named Teena, falls in with the wrong crowd and soon has serious problems of her own.Now joining the family is another troubled young woman named Bonnie, whom Henry had married in California before leaving for Korea. Bonnie sees how things are dissolving around the family, but the question is can she do anything to stem the tide of trouble. More important, does she even care enough to want to?MacDonald teases out of all of these relationships a compelling story that touches on themes that were particularly relevant in the early 1950s, like juvenile delinquency, drug abuse, social and economic decay, and the place of family in the larger society. The criminal activities that occur in the book are of somewhat lesser importance than these larger issues, and at the heart of the novel is its central question: Are some people simply born bad and beyond redemption, or can people who might once have made a mistake truly change, reform their lives and become productive members of society?The Neon Jungle is a fascinating and entertaining read and it is one of a number of MacDonald's novels that have now been republished in great new trade paperback editions by Random House. This is very welcome news for long-time fans of MacDonald's who will now be able to fill out their collections, and it's also an opportunity for people unacquainted with MacDonald's work to be introduced to one of the masters of crime fiction in the second half of the Twentieth century. I'm going against the grain with this one. Not because the writing isn't strong - it is, with some of MacDonald's most penetrating character and cultural analysis - but because the narrative strategy made it so I never really "bought in. "The point of view is omniscient, but not really wide ranging. The novel begins with a detached several page description of "the neighborhood" as a prologue. Then for the next several chapters each is zoomed in on one focal character. So just when you think the story is about Bonny, we leave her and shift to a chapter about Paul, and then Walter, and then to Teena, and Jana and Vern, and on it goes. Then we circle back around to some of them but not all. Finally, as the novel nears the climax we have a chapter where we rapidly shift amongst the characters in more typical omniscient fashion and that works to lock in the narrative with a propulsive energy. The main defect, though, is that there's never a sense of whose novel this is, never a sense of who we are supposed to be rooting for and who we are supposed to be rooting against.Great writing at the micro level but it never engaged me at the macro level. One of my lease favorite MacDonald novels. I remain a big fan of JDM's pulp fiction titles published before he began writing his Travis McGee books. 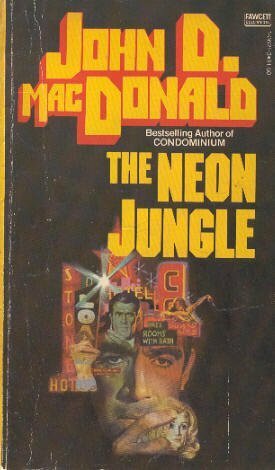 The Neon Jungle (Random House reissued it in 2014 which is the version I read) is his 1950s juvenile delinquents novel. I love the way he draws his characters. He also uses a Mike Hammer reference with one of the characters. Great stuff. Great book, but then all of JDM's pretty much are. another from macdonald...he has a pile of stories, hey? i mean a big hopping pile of stories and in this kindle edition dean koontz gushes about the stories, says he...forget the word he used...but he ignored the stories for some time before he read one/some and was hooked, read many over and over.i've read a few from macdonald...something blue...figured to give a few of them a go...see what gives. onward and upward.finished...good story...reminds me of watching a play...a black and white t-v show from the ago...small cast of characters nothing more nothing less...conflict...resolution. something about social issues mayhap. bull of a cop...once bad always bad...social worker once bad possible to change...others who fit that billing. bonnie...there, i think i was looking for more...something...more information, a reason why...had a sense of being told rather than being shown. curious manner, the telling...a kind of flyover...things in general, neon...then to the particulars...had this sense of a scientist who is somewhat interested in the take, but not invested in it...black red some win some lose...no real sense of...what is the word? passion. no sense of that looking into the abyss the abyss looking back at you...or how's it s'posed to go...something about obsessions...have your obsessions and your obsessions having you...there is that sense in this story...macdonald tossing in ingredients.and heh! there's this line or two at the end that brings to mind the old black and white shows...the guy grabbing girl...this sense of that's okay. ha ha ha ha! i can imagine some of the more enlightened crowd reading this and taking a dim view of some happenings herein. good writing...seemingly accurate portrayals save for bonnie, who seems...unreal or something. she played such a large role in the story...and you know...perhaps she embodies that sense of the disinterested scientist...only concerned about her own navel...and then she is awakened from that slumber. hmmm. i dunno. onward, upward. John D. MacDonald who is best known for the Travis McGee series of mysteries, also wrote many fine stand-alone novels, typically published as paperback originals during the post-WWII era, the most popular of which is The Executioners, adapted twice for film as Cape Fear. After decades of being out of print, Random House is finally issuing these titles in trade paperback. The Neon Jungle (1953) is a naturalistic portrait of an unnamed American city, featuring an ensemble cast of characters. The focus is on the Varaki supermarket run by Gus Varaki a generous and compassionate (though overly trusting) man who is willing to give parolees a second chance by offering them a job and lodging. When his son Henry is killed in the Korean War, the family is thrown into turmoil. Gus neglects his young wife Jana. His daughter Teena falls in with a fast crowd who introduces her first to marijuana, then to skin popping heroin (!) His son Walter (disgruntled by his thwarted ambitions, discontented working in the family business and unhappy with his nagging wife) has begun to extort money from the supermarket as part of a plan to abandon his pregnant wife Doris. An employee, an ex-con named Vern, is using the supermarket delivery service as a front to distribute narcotics. All these elements converge in a violent and explosive climax with Gus being manipulated into an act of murder by Vern, whose villainy approaches Iago-like proportions. I'm going against the grain to say that I prefer MacDonald's stand alones over the Travis McGees. This book is one of the reasons why. McGee is a superficially complex character. He seemingly goes through changes during the book but at the end, reverts to the same character he was at the beginning--as all serial characters should. The characters in this, and his other stand alone books are complex to the core. Yes, there are issues and attitudes that were considered normal back then but are not now--most especially violence against women. But readers need to keep in mind that times were what they were and more importantly, MacDonald is writing noir...that's NOIR with a capital N-O-I-R. If you want sweetness and light, go someplace else. If you want deep-down dark and gritty--you've come to the right place. This 1953 novel came at the beginning of John D. MacDonald's novel writing career. His first novel, The Brass Cupcake (1950), was only three years earlier. The novel is dated by the reference to the Korean War and is draggy at times but ultimately rewarding.Henry Varaki rescues Bonny from a back alley beating, nurses her back to health, marries her and sends her home to his family before going off to be killed in Korea. At the Vakaki family market business, Bonny helps out but is unresponsive and spends her time in self pity until shocked out of it by parole pfficer Paul Darmond. Newly alert, Bonny realizes that Henry's older brother Walter is stealing from the till and delivery man Vern is sleeping with father-in-law Gus' young wife. Plot lines combine in an explosive finale. WOW - this book was written in 1953 but could have been written yesterday - timeless!! It doesn't take place in Florida or the gulf region which surprised me, as all of his other books I've read do. This could have taken place anytime or anywhere. One of his VERY BEST!! 3.5 stars. I can't believe that women used to support the idea of wife beating! Beyond that, this was a powerful story with strong characters. My first JDM book. Seamy noir '50s crime thriller, with bad girls, juvenile delinquents, sleazy affairs, and drugs! I've re-read it again and again. As relevant today as it was in the 50's. In fact, frighteningly so. Magnificent book by a master. Brilliant descriptions.Interesting arrangement of events.Some sentences were as short as just one word and I liked that technique. brilliant from beginning to end.john d macdonald what more can you say.